The funny thing about this game and its predecessor, R.C. Pro-Am for the NES is that the graphics are so primitive, at least when compared to today’s awesome graphics, that one can hardly tell that you are actually racing R.C. cars and not actual cars. I spent years playing R.C. Pro-Am as a kid without putting 2 and 2 together and realizing “Oh, they’re tiny cars and R.C. stands for ‘radio controlled’ and OMG I WANT ONE OF THESE FOR CHRISTMAS!” They just looked like regular ol’ cars to me. Thanks NES. 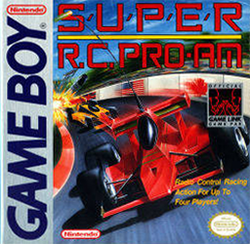 The same problem exists in the game featured in today’s episode, Super R.C. Pro-Am. This was developed by a company called Rare, best known for their critically-acclaimed smash hits Kinect Sports and Grabbed By the Ghoulies. They also did some little-known series of games called Donkey Kong Country and Banj0-Kazooie. As if saying “From the creators of…” was ever a guarantee of a good time. So, jumping into the game, you get the title screen, hit start and BOOM! Right into the first race. No options menu, no additional game modes, no pre-race preparations. Rare treats the start button as the ready to race button. The first thing I noticed was the sound. Just like the NES original, there is no music during the race. Pre-race and post-race there is some music, but during the actual gameplay itself, you merely have sound effects. These sound effects are brought over from the NES version but with slight “improvements.” I use that term lightly and put it in quotes solely because of the sound of the tires screeching when you round corners. This is the sound you will hear most of the time and the sound that drove me to turn the volume off after a few races. It’s as if someone is stepping on a cat every time you turn. Aside from the sound, the actual gameplay is quite good. The controls are simple, B to go, A to fire weapon. Weapons include rockets to shoot ahead of you or mines to fire behind you. You can only switch weapons by picking up that weapon on the track. Each weapon pickup gives you 5 ammo and stars scattered about the track add 1 to your surplus. There are also tire, battery, and engine upgrades for your car that you can pick up which you WILL NEED in order to succeed in later levels. Same goes for the letter pickups. 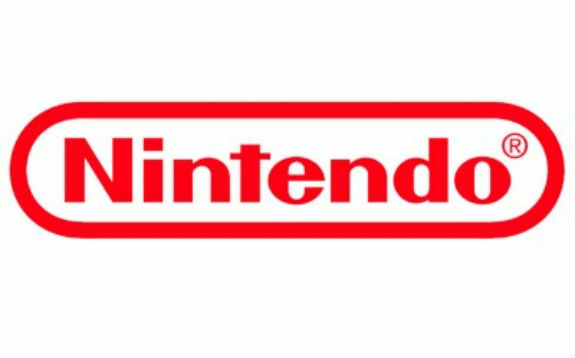 These letters spell “NINTENDO.” Spell “NINTENDO” and you will be granted a whole new model of car. Fun Fact: “Spell ‘Nintendo’ and Win A New Car” was a game edited out of a 1993 episode of The Price is Right. That’s pretty much all there is to the game. Race, shoot, step on cats turn your way to victory. Upgrade your car, rinse, and repeat. 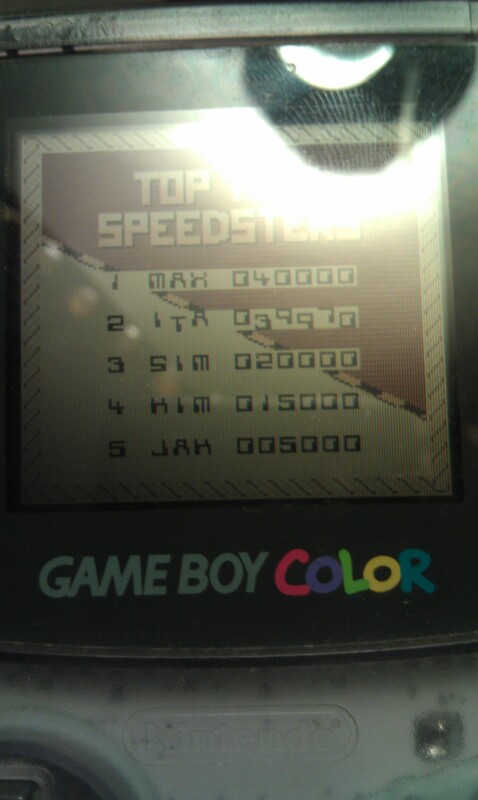 Just like nearly every game in the 80s and 90s there is a score and a high score list. The score just seems to serve a purpose of progression in the game, since there is no save or password option. 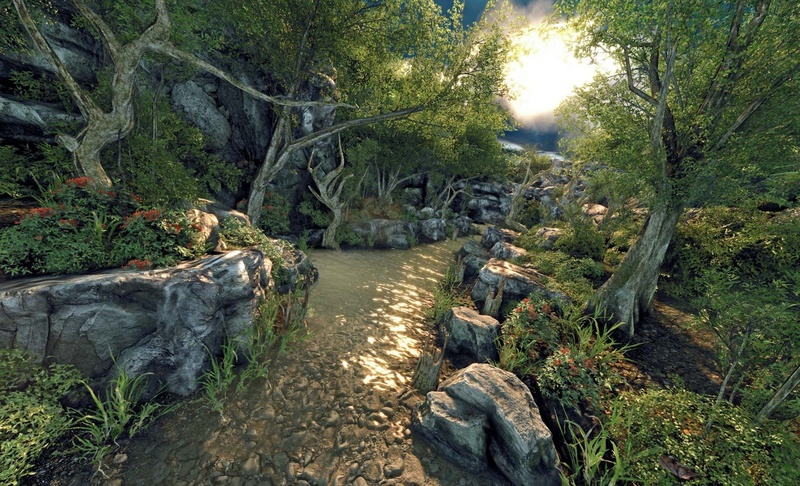 Actual shot taken from my game. I was 30 points away from the top score after my first game over! 30! I was a little tentative on giving this game the bargain bin treatment. I feel that the fun factor of a game is very important and this game was actually fun to play. However, I saw everything this game had to offer within the first 10 minutes. There are things that get thrown at you hazard-wise on the tracks in later levels, but these start to pop up fairly early. In addition, this game is virtually identical to the NES version aside from a few cosmetic upgrades. After playing the game for a while, I don’t feel compelled to pick up and play it again. This series would be a perfect candidate for a modern-day remake and I think it would be fantastic. Until then, this game, sadly, must stay in the bargain bin. So that’s it for Episode 2 of Five Dollar Gamer! If you want to leave comments, praise, criticisms, or suggestions you can leave them here, or on The Official Five Dollar Gamer Facebook Page!